While in Chicago last weekend for Lollapalooza 2010 I was able to do a bit of sightseeing. 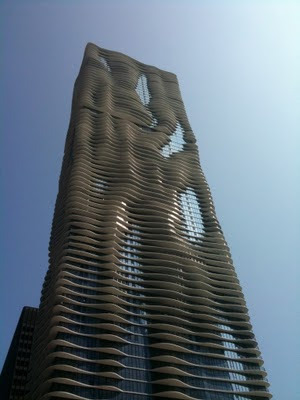 Among the highlights was the brand new Aqua building designed by Jeanne Gang. A gem among other Chicago stand-outs, the Aqua was named the Emporis 2009 skyscraper of the year. The building is an 82-story mixed-use residential skyscraper in the Lakeshore East development in downtown Chicago. Its appearance changes significantly according to the viewer's position. To capture views of nearby landmarks for Aqua's residents, its balconies extend outward by as much as 3.7 meters. The result is a building composed of irregularly shaped concrete floor slabs which lend the facade an undulating, sculptural quality. The name 'Aqua' fits the nautical theme of the other buildings in the Lakeshore East development and is derived from the wave-like forms of the balconies.